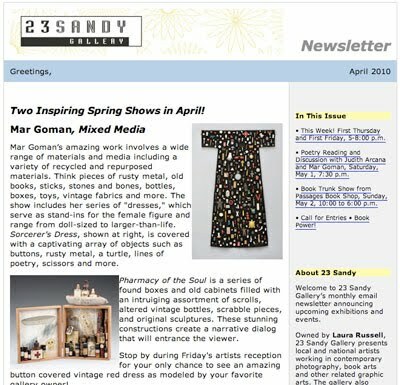 Just in case you don’t subscribe to the 23 Sandy Gallery email newsletter, we have posted the new April issue on our web site. Click here to see all the exhibitions and events we have planned in the gallery this month. Last chance to see three awesome exhibits! If you haven’t already, you still have time to see our current shows. These exhibits demonstrate paper and book arts at their best. In this new body of work, Flynn re-interprets the ornate vintage signs that hang over the doorways of merchant houses throughout France. The original cut metal signs created a picture: here a fish shop, here a leather tanning shop, here a tailor. Flynn’s distinctive paper cuts re-create this antique commercial culture. Her delightful paper cutting techniques re-interpret their modern message about “what lies inside.” This is Flynn’s second solo show here at 23 Sandy Gallery. View an online catalog of Virginia’s show here. Chicago binder, book and installation artist Karen Hanmer’s intimate, playful book works fragment and layer text and image to intertwine memory, cultural history, and the history of science. Hanmer skillfully pairs imagery and text with structure to create moods and invite the reader/viewer to become part of the story as they interact with the work physically and emotionally. Karen Hanmer exhibits widely, and her work is included in collections ranging from Tate Britain and the Library of Congress to UCLA and Graceland. Karen is the current Exhibitions Chair for the Guild of Book Workers. Complete online catalog of Karen’s show here. 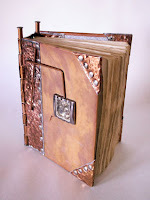 The Naked Book was curated by Linda Kiley to honor the technical beauty of book construction with an exhibition of blank, handmade books suitable for use as journals, sketchbooks or other creative gestures. 35 artists from the US, Canada, and even Italy, will show their books in all their naked glory. All books will be available to take home immediately so you can get started adding your own special touches or thoughts to the pages. These books also stand on their own as wonderful pieces of art and craftsmanship. A full online catalog for The Naked Book can be found here. 23 Sandy Gallery is located at 623 NE 23rd Avenue, Portland, OR. Gallery hours are: Thursday-Saturday, Noon-6:00 p.m. and by appointment. We are open until 8:00 p.m. on both First Thursday and First Friday. THEME – Book Power is seeking artist books addressing the social, political or environmental issues of our times. Can an artist book be a vehicle to shed light on the problems we face in the world? Can books be a call for change? Can we go beyond just artists who make things to artists who make things happen? War, poverty, decay, politics, conflict, revolution, feminism, environmental, economic and political upheaval are but a few of the issues that concerned book artists can use to engage their readers in an effort to raise consciousness, call for justice or provoke action. Perhaps we really can use our creative powers to solve the problems of the world. MEDIA – This exhibit is open to book arts related artworks created as either edition or one-of-a-kind. Artist books, sculptural books, book objects, altered books, zines or broadsides are encouraged. Any medium, any style, any size. Last year at the CODEX Foundation book fair in San Francisco I discovered two young gentlemen from the Bay Area who have made some terrific limited edition artist books. Jonathan Fetter-Vorm and Tom Biby, who call their press Two Fine Chaps, started out in the world of comics and have since branched into artist books. Their books are just fantastic: beautifully designed, fun, witty and produced incorporating techniques as diverse as letterpress printing, laser cuts and pop-ups. Their newest book is the third in a series of similar-sized and styled pop-ups. The first two books in the series sold out fast. You might remember the very popular Spectacular Vision from our gallery inventory. 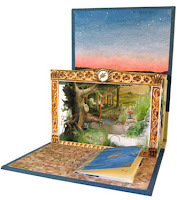 The new book is called Silent Spring and features a similar pop-up structure with fantastical illustrations and a miniature book inside that holds their own original fable. Act quickly if you’d like to add this terrific book to your collection. I’m sure this edition of 30 will sell out fast. See more artist books by Two Fine Chaps here. 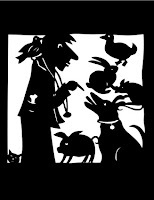 Join us Next Saturday, March 20, 2-4:00 p.m.
Virginia Flynn’s show of her lovely paper cuts in the gallery this month has been so popular! It’s very exciting to see how many people have really responded to her work in her show titled, The Butcher, The Baker, The Candlestick Maker. 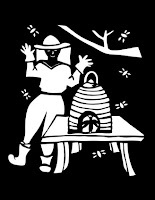 The most popular cuts so far are the vintner and the bee keeper. But, really they are all so darned sweet that it is hard to pick a favorite, unless you just happen to be one of the professions featured in the series of 19 cuts. If you like Gin’s work you should mark your calendar for an open house at her inspiring backyard studio, next Saturday, March 20 from 2-4:00 p.m. Virginia’s creativity extends beyond just her paper cuts featured in the gallery. She is also a talented printmaker and painter. Come visit her studio, learn more about the process behind her art and enjoy a chance to get to know the artist. We’ll provide coffee, tea and pastries. It’s also a good day to stop by the gallery on your way to or from her studio to see her new show in the gallery. Please RSVP to Laura. Contact info here. When we receive your RSVP we’ll send a map to Virginia’s studio. Click here for a preview of Virignia’s delightful show. 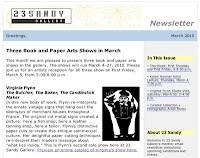 Just in case you don’t subscribe to the 23 Sandy Gallery email newsletter, we have posted the new March issue on our web site.